Condiments are an essential part of any well-planned menu. These sauces, dressings and salsas allow people to add a bit of flavor and fun to their dishes. When you're hosting a party or enjoying a meal with your loved ones, a little variety goes a long way to keeping everyone happy and satisfied. However, serving them sometimes is tricky business. No one likes the look of plastic bottles on their dining room table. 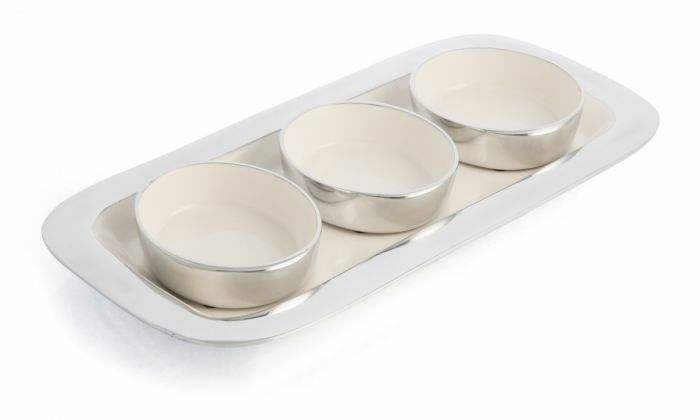 With this set of condiment bowls and serving tray, your problems are solved. Fill each cup with a different condiment to complement whatever dishes are being served. The oval shape holds more than you might realize at first glance, making it easy to share with multiple guests. Thanks to the serving tray, passing around the condiments is a cinch. The aluminum and enamel material is sure to look lovely on your table and match your silverware perfectly.